Second Life affords me the ability to play dress up on a really grand scale. If nothing else, this has by far been the reason why I keep coming back. The ability to morph my avatar into just about anything is very tantalizing. I started the look with the skin which I basically did just as a way to use some awesome crack brushes I found on Deviant Art… I’ll hunt down a link and try to throw it in later. My husband always tries to throw suggestions at me for things to do and he had said something about Salem Witch Trials. Well, that seemed like it wouldn’t exactly translate to a skin so I went with an “After” theme which can really be translated however you like. 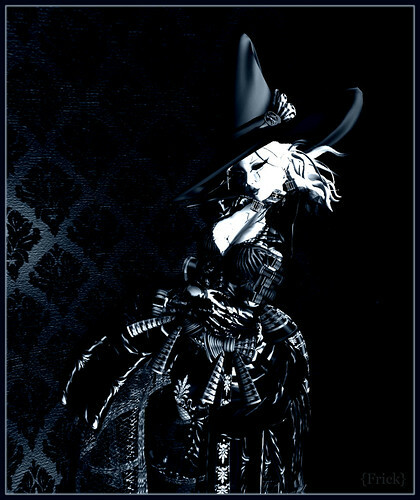 I started out with the Minerva Witch’s Hat from Illusions.. another stunning piece of work from Siyu Suen and the catalyst for the whole outfit. I probably spent hours scouring the grid to find an outfit that gave off the air I wanted it to when I went back to BareRose for the umpteenth time and saw this outfit named “Stheno” and knew that was the one. Throw on some accessories and here you are. 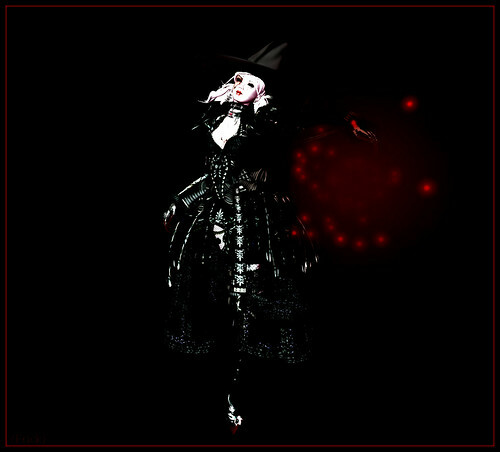 This entry was posted in Fashion, Pictures, Random and tagged Artsy, Bare Rose, Cracked, Illusions, Second Life, Witch. Bookmark the permalink. Yes, I knew there was some thought to all of it.. very nice expression of that thought process! But then again, you know what I think;)..
And I think I am harsh with the masses.. not ALL of them are expressing their vanity and ego.. I was over generalizing from looking at the magazine cover contest entrys and being very frustrated about how so many represent or would like to represent SL in just an idea “the AV as my self… ” Its just that it is the creation of “the image” which can be “the AV” but not a representation of SL as a place. I see it as a place where people’s imaginations meet up with other people’s imaginations.. and sometimes they even have stuff to talk about :D! This image of “the Witch” (especially in context of the witch trials) is a great representation of the individual swimming against the stream.. to do something different and creative.